Buildings and building materials from an assortment of manufacturers to customize and theme all aspects of your garden railroad or model train layout. 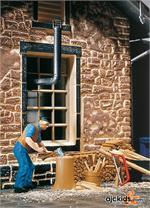 Figurines from a wide variety of manufacturers to complete the detailing aspect of your garden railroad or model train layout. Silver Round Corral Panels -5 Panels Plus SM.Gate. Pola's garden railroad decorative element of a street lamp. 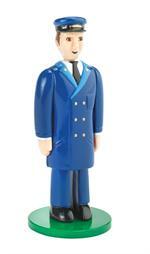 Bachmann Conductor in blue uniform standing at 3 1/4 inches tall. 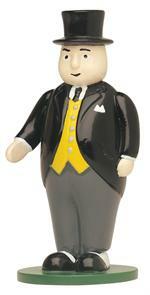 Bachmann's Sir Topham Hat stepping out in fashion. Figurine measures 3 inches tall. 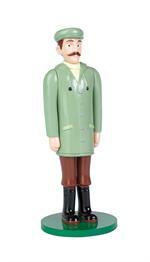 Bachmann figurine Farmer McColl with a distinctive styling stands tall at 3 3/8 inches. Rough Opening 1.33" X 1.33"
Rough Opening 1.33" X 2.2"
Rough Opening 1.33" X 2.86"
Rough Opening 1.47" X 3.45"
Part Number: BCH Blue Engin. Clear Cedar - Great for Trestle Building! Large Silver Gate, 3 1/2" by 5 1/2"
The excitement of rail travel! 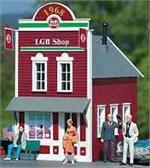 Add this passenger figure by LGB Trains to any garden railroad for that finishing touch.